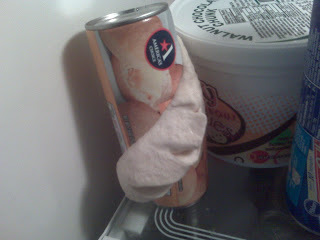 Life with Giggles: Popping biscuit cans everywhere! So, today after I worked a half day, I went to pick up my sister who is visiting from Puerto Rico, along with my two beautiful niece and nephew! Before I picked them up, I had to stop by the food store to pick up a couple of things for dinner. One of the items on the list were some biscuits. I bought 6 cans (I LOVE them), and figured I would store some for next week's dinner menu. I put all the groceries in the trunk of the car and head off to my mom's house to pick up my sister and the kids and bring them back to my apartment. As I am driving, I hear a loud bang, and I simply think that it's one of the cans from the grocery that fell out of the bag and is now rolling back and forth in my trunk. 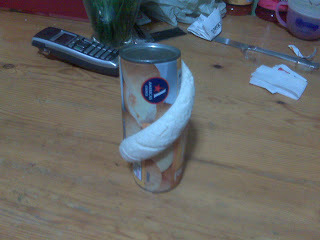 When I get home and start to take the groceries out of the bag I noticed that one of the cans of biscuits POPPED open! That is when I realize that the loud noise I heard was when the can popped in my trunk. Below is a picture of how the can looked like. I am in the kitchen washing the dishes while chatting with my sister who's sitting at the kitchen table. All of a sudden we hear a loud pop. I am thinking that maybe my niece dropped one of her toys. When I check on my niece I see she hasn't dropped anything and my sister tells me that it sounded like it came from the fridge. When I open the door I see the biscuit can at the bottom and think, oh the can just fell from the shelf. Nope, I was wrong. AGAIN another biscuit can popped open! So, at this point, my sister, Mr. Newlywed and I are in awe that yet again, I had TWO cans of biscuits popping in just ONE ENTIRE DAY! People, this would only happen to me!